Gift your dear one this Swish Black Kurti by Wills Lifestyle and make her feel very special. 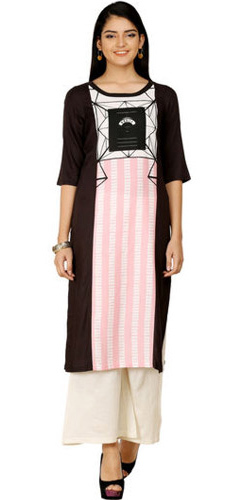 This urbane all- black Kurti has been styled by W and is one of the best picks of the season. With is light base material tailored out of rayon fabric and sober frontal display, this Kurti will carve out an impeccable place, both in your heart and wardrobe. Flowers Delivery Barrackpore, Send sweets Solapur, Wedding Cake Vasco, Diwali Mithai Raichur, Send Flowers and Gifts to Cochin, Online Shop Cuddapah, Flower to Jhalawar, New Year Flowers Gopi , Fresh Fruits Tellicherri, Send Gift Zirakpur, Dry Fruits to Durgapur, Birthday Delivery Khammam, Sending to Ratnagiri, Flower shop Kozhikode, Modinagar Online Cake Delivery.